Beautiful Flower Vase Word Template is a free template with Beautiful Flower Vase illustrations that you can download to make template on Beautiful Flower Vase. Download free Beautiful Flower Vase ms word templates and make your template attractive. 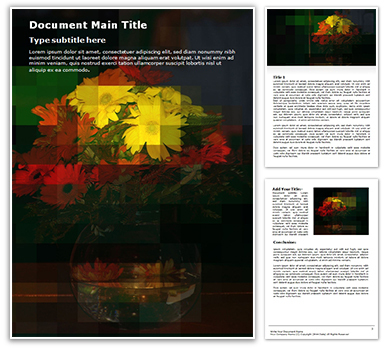 This Free Beautiful Flower Vase microsoft word Template has 3 slides with some sample text, which is fully editable. After click on "Free Download" button you will got a mail with free download link of Beautiful Flower Vase Word Template. Description : Check editabletemplates.com's Beautiful Flower Vase free word template now. Be effective with your documents by simply using our Beautiful Flower Vase editable and free word template which is absolutely free. This Beautiful Flower Vase Word template free download is royalty free and easy to use. Download our Beautiful Flower Vase Word template now for professional Word documents with compelling background design. This Beautiful Flower Vase Word template free download is best for printable business documents, business proposals and other PDF and Word documents in the field of medicine and healthcare. Whether you are creating a business reports, school reports or industry reports, get started quickly with our pre-formatted MS Word templates with decor, energy, elegance, nature and similar background designs. With our Word templates, you will find it very convenient to insert your text and customize the layout. Download this Beautiful Flower Vase free word template created by our professional graphic designers now and get your assignment or business report created with style to deliver it on time!